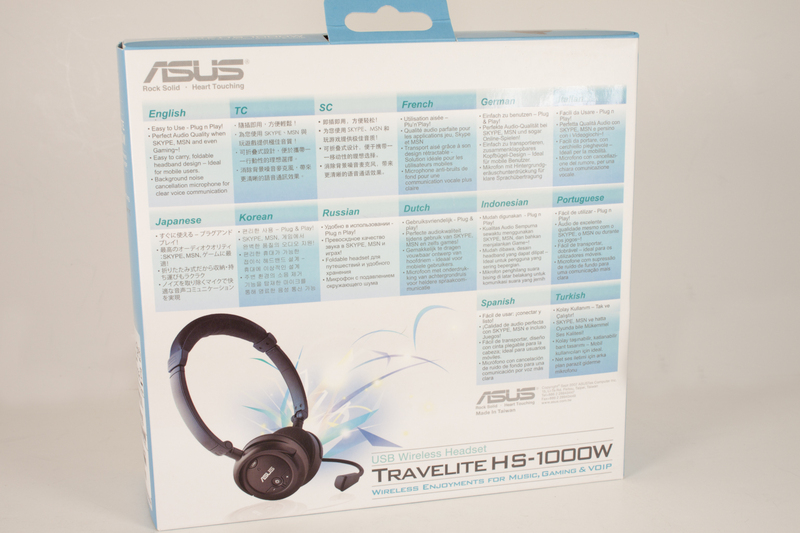 The box that the HS-1000W ships in was less exciting that I have come to expect from Asus. It is very understated and clean box. At least it is on the surface, in keeping with the fact that this is still a computer component there is a flap that, once lifted, exposes you to the more common marketing images found. According to the inside flap the major benefit of owning the HS-1000W is ease of use. 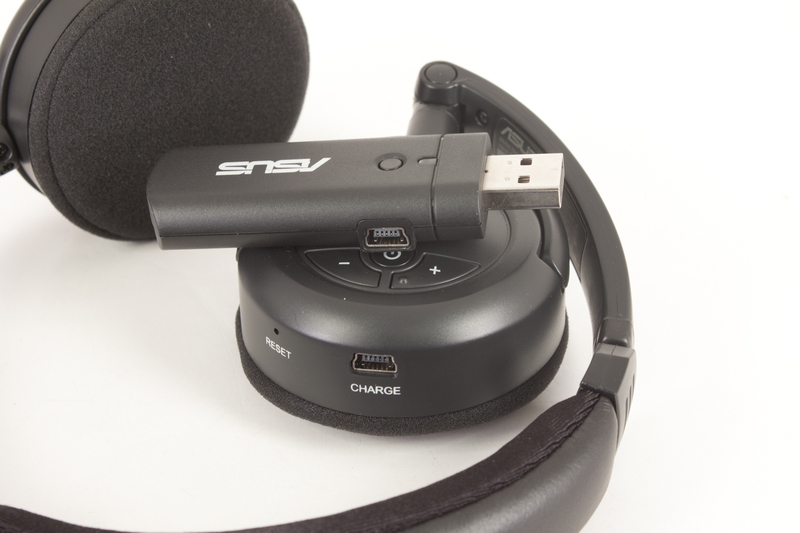 Easy installation, ease portability, easy charging, easily adapt into your listening style (gaming, movies, etc.). 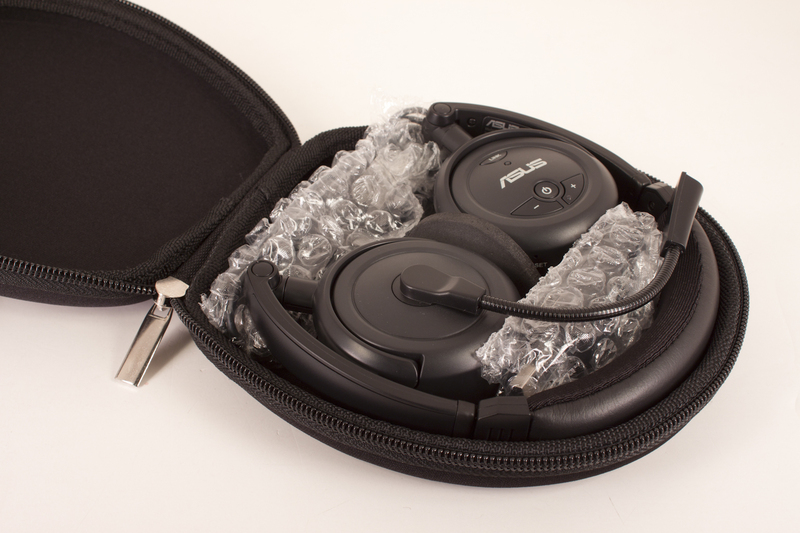 Inside the box we find the HS-1000W already packed into their carrying case as well as a very simple manual. 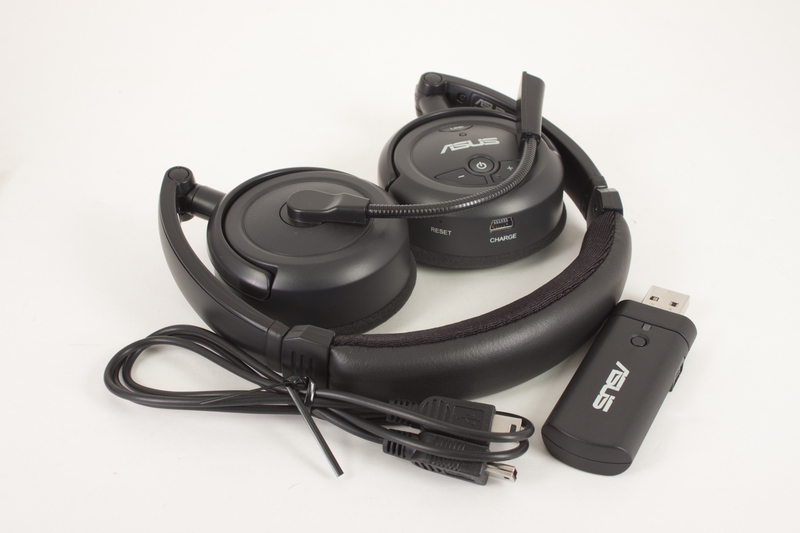 Asus has included the HS-1000W headset, the wireless audio dongle and a mini-USB to mini-USB cable that connects the two during charging. Pretty much everything you need to get started right away. Measuring audio performance is not an easy thing to do. You could spend thousands of dollars (and cost millions of lives… sorry minor Animal House moment) on quantitative audio sensing gear, but that would still not tell you how they will sound. It will just give you a measurement of the sound reproduction. For me I would rather hear someone’s opinion of the audio quality with some additional input from different listener types. A good descriptive paragraph detailing the feel of the sound is much better than just a series of numbers from a piece of test equipment. 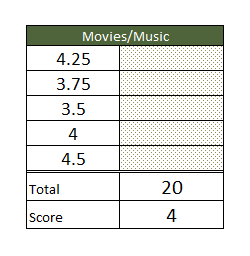 For our testing I will describe the feel of the audio as well as include ratings (one to five) and a single word description from at least five other people with different musical and audio tastes. We hope that this will give you the best idea of the audio quality of the audio gear under scrutiny. 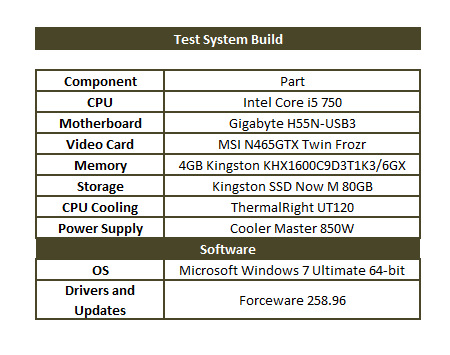 The test system used this time is one that was put together for some 3D Gaming tests. It was built shortly after we finished up with our basic review of the H55N-USB3 from Gigabyte. We felt that the combination of hardware would give us a great platform for testing multiple audio types as well as adding in an extra (and unexpected test). Although we have always talked about audio as a compliment to the video you are viewing we noticed that when we turned on the 3D mode the quality of the audio became even more important. 3D Vision can make a game significantly more immersive (and others it makes hard to play and annoying) if your audio quality is weak it can seriously affect the immersion level of the game. 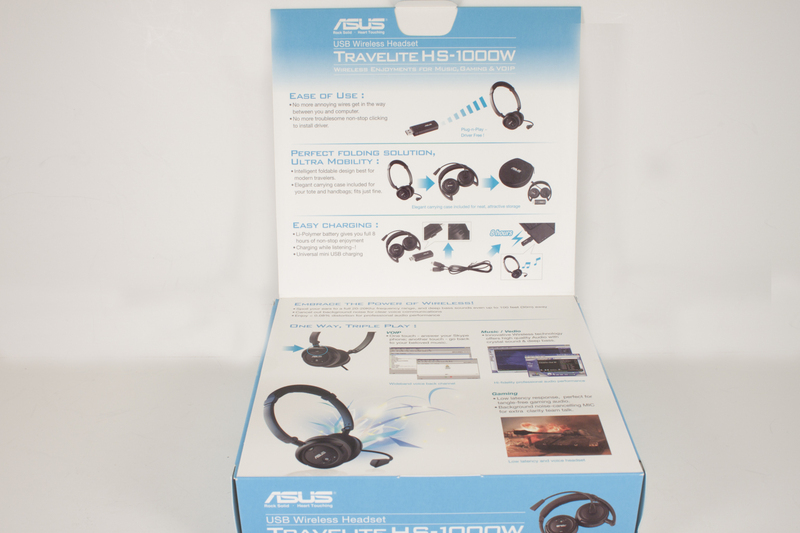 We wanted to add this new test into the mix and see if the HS-1000W helps or hinders the immersion level of 3D Gaming. In the box the HS-1000W has a listed frequency range of 20Hz to 20,000Hz (KHz) with a Total Harmonic Distortion level of .08%. This level of frequency response in a wireless audio device is pretty impressive, but can the HS-1000W really deliver this? We put it to the three usage models listed on the box (gaming, music/video, and VoIP chat) to find out. For our gaming tests (as we mentioned above) we used 3D Vision enabled games for a more immersive feel. 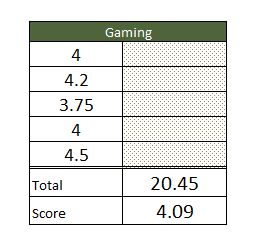 The games used for this test were; Bioshock 2, Call of Duty 5 Wolrd at War, Batman Arkham Asylum. For our video testing we played around with some HD YouTube videos, a DVD movie and finally a Bluray movie. Music was fairly easy to setup, we used music downloaded from Zune as well as CD audio. 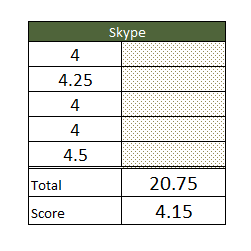 Our VoIP app of choice was Skype. As you can see our test group liked the audio from the HS-1000W. It was not the best they had heard but it was clearly very good. Gaming and movie performance was not as good as the Skype performance that was reported. Part of our group did tell us that the sound was odd in some way; they described it as a weird feeling of being in a closed in space. They still said the sound was good, but that it just sounded odd. For me I felt the audio was good, the range was excellent. The clarity in the mid-level frequencies was good with no mud. The highs and lows were excellent; there was none of the “tinny” sound that you get when a driver is pushing frequencies that are too high for it. The lows were clean and even at high volumes did not hurt the ears. There was a small problem though; even though the audio quality was good with clean separation it still sounded confined. Not like listening to something in a small room, but more like there was no space to the sound. This was probably due to the smaller size of the driver and the way the headphones position themselves on the ear. As you will read below they sit on the ear directly. This can have the effect of changing the shape of the ear canal and giving a muffled or close effect to sounds you hear. So while the audio is good, the pressure put on the ears themselves reduces the quality of the audio. The Battery life on the HS-1000W was not as advertised, but then again nothing ever is. The charring time was accurate though. It took a little under 2.5 hours to charge the HS-1000W from a dead battery to a full one. After that things got a little odd. 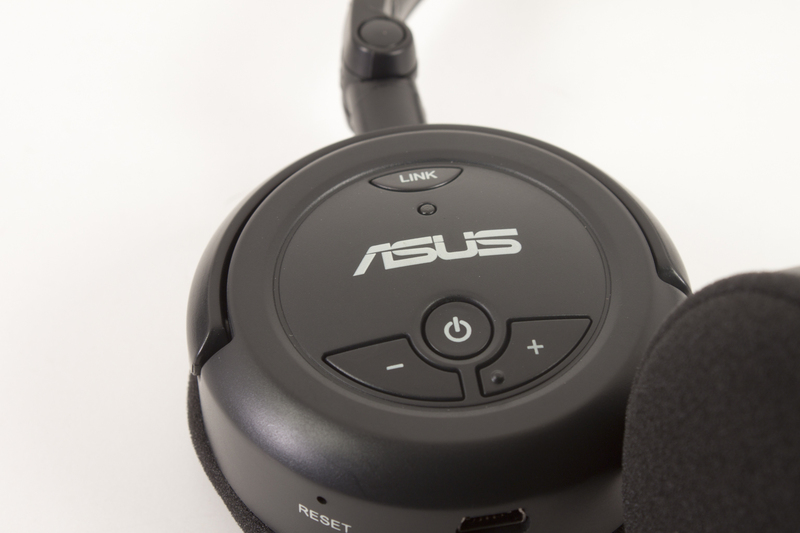 The specs page on Asus’ website makes claims of 8 hours of listen time per battery charge. We did not see this time at all. Our average charge time was around 4-5 hours with a maximum of 5.5 hours. This was over a total of 10 runs from full charge to being unable to connect to the audio system. At the time of this writing I was not able to test the 30 day standby claim but I have a feeling it will also not be quite that long. 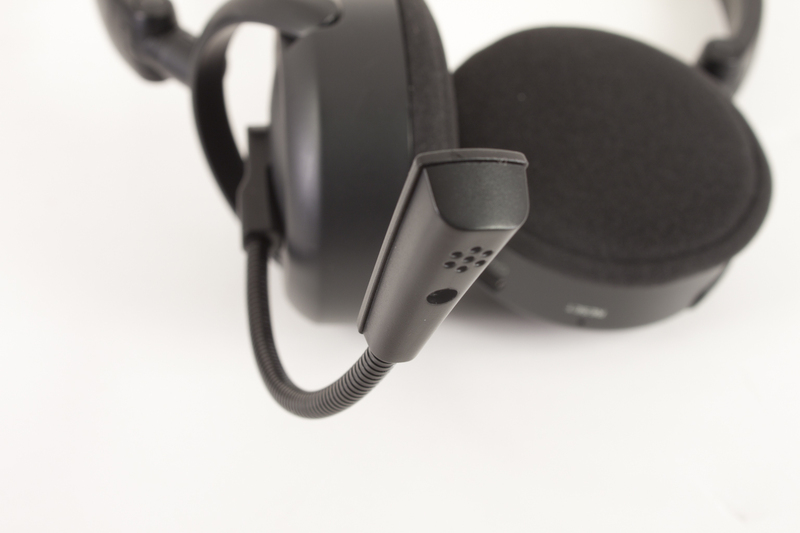 The HS-1000W headset sits directly on the ears. This is fine for many people and worked well for me for the first hour or so. After that my ears started to hurt a little and the audio quality went down accordingly. This was because when you compress the outer ear for an extended period of time it can cause the ear canal to swell slightly this will give the audio coming in a muffled or tunnel effect. But again not everyone will suffer from this, about half of the people in the testing group said they were a little uncomfortable after 30 minutes, the other half did not note any discomfort. You results may vary. At a $49.99 the HS-1000W is a great deal. 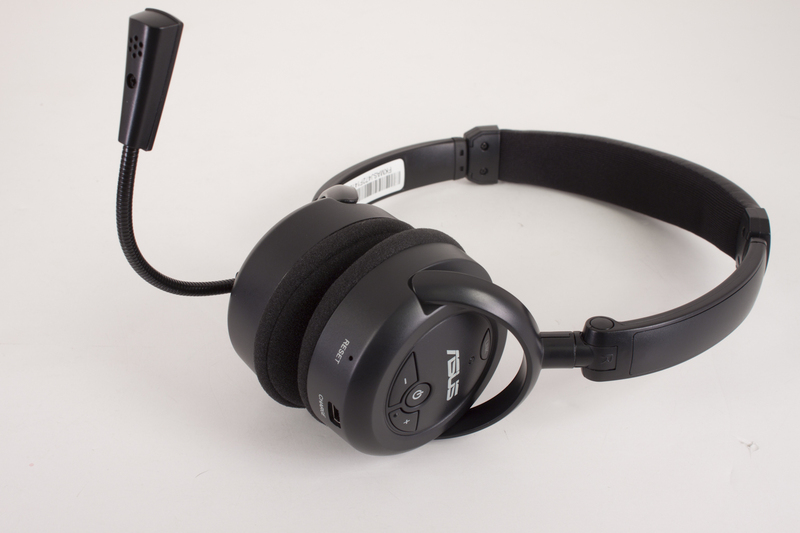 It is priced well below what some lower quality wired headsets run. 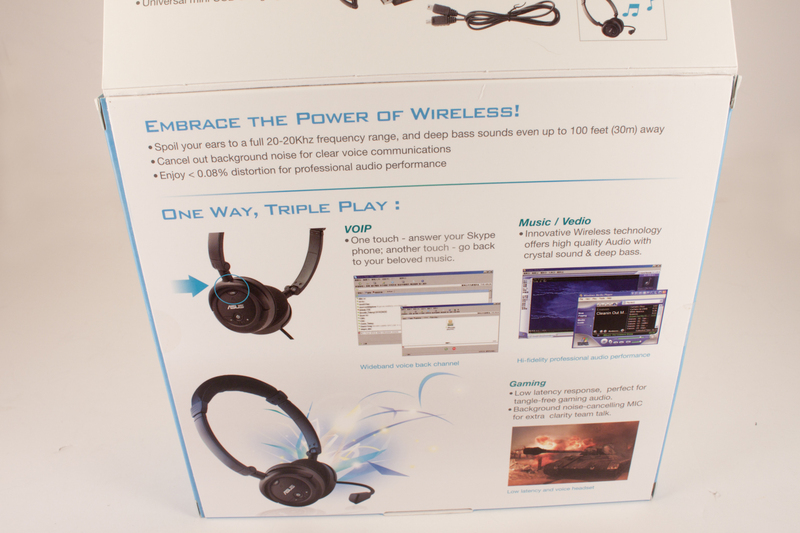 But with the HS-1000W you get not only the wireless headphones and microphone but an audio device that requires almost no interaction (with Windows Vista or Windows 7). We were hard pressed to find another product in the same range (even different versions of same core components) at the same price. 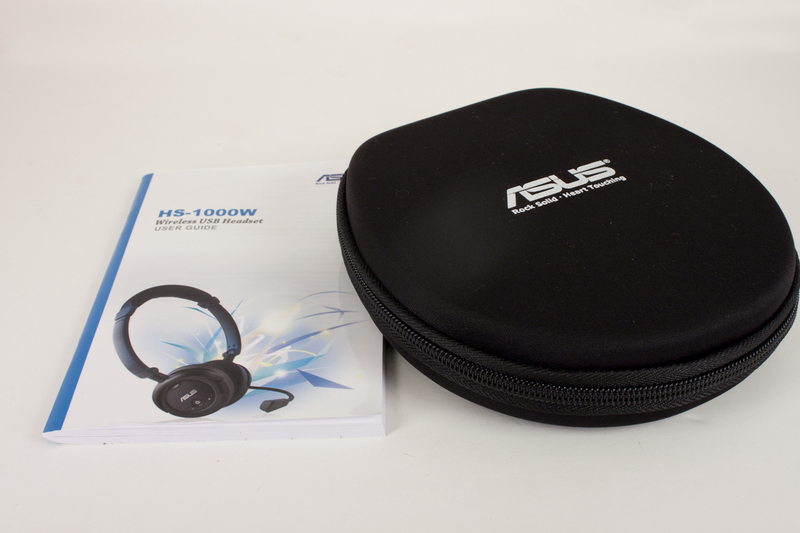 Asus’ HS-1000W is a nice product. The plug and play aspect of the HS-1000W was amazing and is possibly the simplest audio product I have worked with. Even on a motherboard with no sound card installed you can drop this in and get running in about 3 seconds. 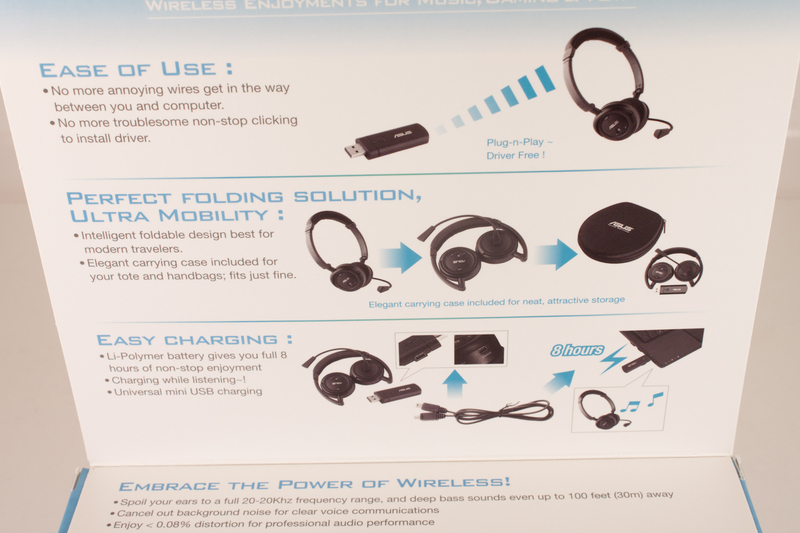 The fact that the headset and USB dongle are already paired makes the connection even simpler. There is no mucking about with Bluetooth pairing or the loss of audio quality that happens with the Bluetooth stereo stack (on many products). Once you get past the three to four seconds it takes to get things up and running you will find that audio quality is also very good. Some people might experience a closed in sound due to the pressure of the HS-1000W headset pressing on their ears, but that is not everyone. The audio quality from the microphone is also good; we did not hear any complaints from the people on the other end of the Skype conversations. As far as travel goes the HS-1000W is a good choice, but I would have liked to see it get a little smaller. Even with it inside the included case it is still pretty big. One of the things that we wanted to do was to see if the HS-1000W could add to the immersion of 3D Gaming. Unfortunately for me at least it did not due to the closed in feeling to the audio. For others it did add to it with the HS-1000W’s full bass, clean signal separation and crisp high end. 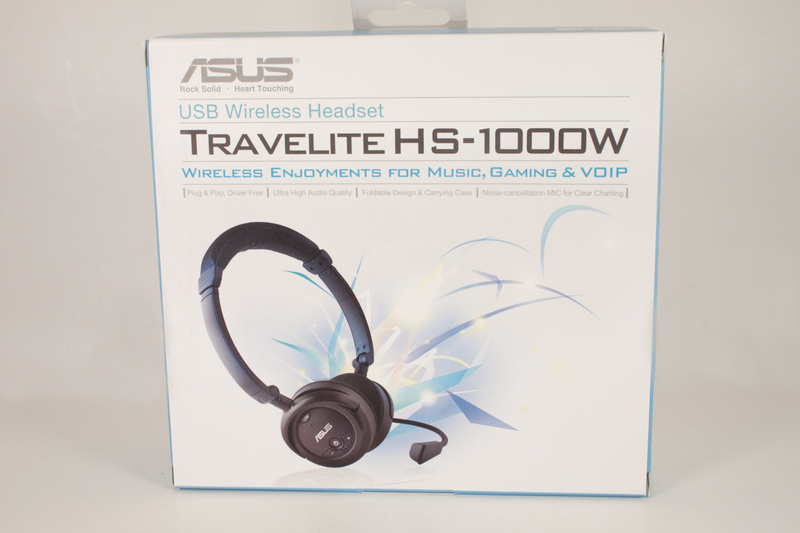 If you are looking for a wireless headset that is easy to use, inexpensive and has great audio quality then the HS-1000W is an excellent choice.